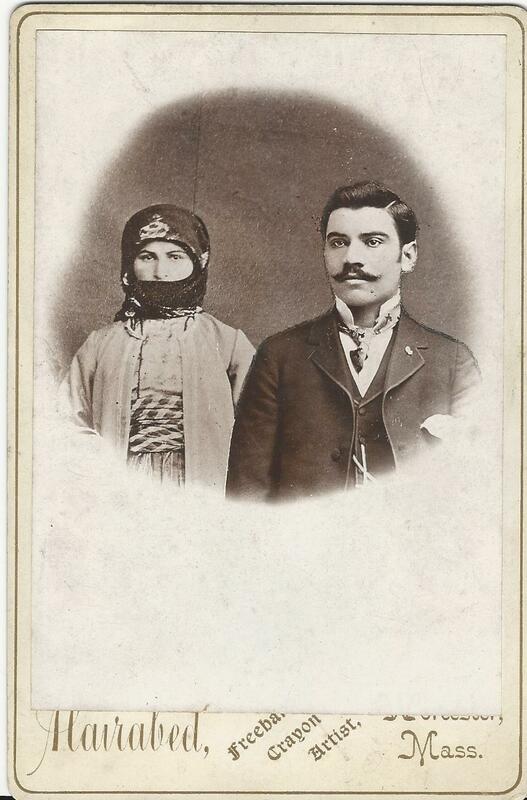 This cabinet card features a lovely couple posing for their portrait at a studio in Andrinople, Turkey. The pair are attractive and well dressed. The gentleman has a handlebar mustache. Is this couple of Armenian origin? It would be so interesting to know more about this couple, but that is an impossibility. The name of the photographer who photographed this image is L. Nicolaou. Preliminary research revealed that the name “Nicolaou” is a surname that can be found in multiple cultures and languages (including Portuguese and Romanian). In addition, the name is also found in Cyprus. This information indicates that the photographer was probably from Bulgaria, Greece or Cyprus; but operating his studio in Turkey. The city of Andrinople is also known by other names, including Edirne (Greek). The city is located in northwestern Turkey, and close to Turkey’s borders with Greece and Bulgaria. Edirne was once the capital city of the Ottoman Empire. In 1928, Edirne replaced Adrianople as the name of the city. Edirne has been the site of numerous battles through history. Some consider Edirne to be the most frequently contested location in the world. A battle that occurred near the time that this photograph was taken is “The Siege of Adrianople” (1912-1913) which was a battle fought during the First Balkan War. An article in Wikipedia states that in 1905, the city had 80,000 inhabitants comprised of 30,000 Turks, 22,000 Greeks, 12,000 Jews, 10,000 Bulgarians, 4,000 Armenians, and 2,000 people of unknown origin. Somehow this photograph survived. It must have been an incredible journey through history and time. The image carries some scars. The borders of the photograph have been trimmed (probably to fit into a frame), and the photograph is a bit warped. Not terribly warped, but enough to be unable to lie completely flat on an even surface. This great photograph would look even greater if it was framed. I suppose I have said enough about the condition of the photograph. This image is absolutely extraordinary. The Armenian family in this image may be one of the most expressive photographed families that I have seen in my many years of viewing historic photographs. This is certainly a family that does not hide emotions. The family is also beautiful and wonderfully dressed. I am having difficulty figuring out the family constellation. In my opinion, either the seven people in the photograph are all siblings, or the image captures a father, mother, and their five children. The father would obviously be the man standing in the rear of the picture. The mother, I hypothesize, is the seated woman. What is your theory about the family constellation of the subjects of this fascinating portrait? There is a note inscribed on the bottom left corner of the photograph. I do not know the translation. 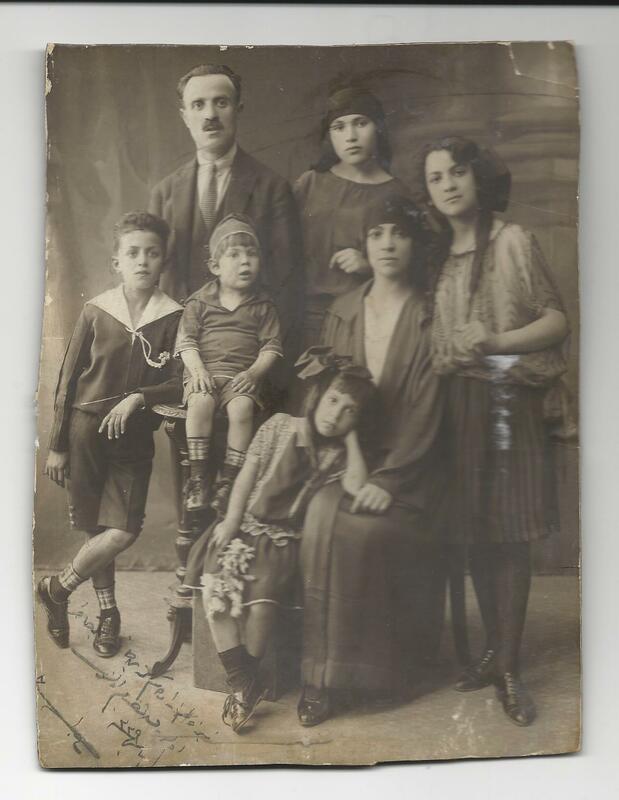 The previous owner of this image informed me that this family is Armenian in origin and the photograph was taken in Constantinople, Turkey in the 1920’s. It is important to remember the terrible holocaust that the Armenians experienced just before the time of this photograph. There was conflict between Armenians and Turks between 1892 and 1915. This resulted in the Armenian Genocide which occurred between 1915 and 1918. Estimates are that between .9 and 1.2 million Armenians were killed or deported because of alleged political and security considerations. By the end of the 1920’s, the only viable Armenian population left in Turkey was located in Constantinople. This photograph measures about 5 1/2″ x 7 1/2″. One of the wonderful benefits of studying antique images is that they often are remnants of important and interesting history. This cabinet card image is a terrific example of a photographer capturing history with his/her camera. In this case, the photographer was just not cataloging history, but he was part of it. Lusadaran, the Armenian Photography Foundation, cites the photographer of this cabinet card. An article on their web site discloses that Hairabed was a photographer in Worcester, Massachusetts in the 1900’s through the 1920’s. During his photography career he had shortened his name from his given name of Hairabedian. There is no mention of his first name. The article reports that he had likely emigrated to America from the Ottoman Empire. Once here, he photographed the first waves of Armenian Genocide survivors and immigrants settling in the Worcester area. His specialty was taking studio portraits. After doing some preliminary research, I may have uncovered the photographer’s first name. The city directory of Providence (1909 and 1910) lists a photography studio operated by Bedros and Astoor Hairabedian. The 1910 directory notes that Astoor Hairabedian moved to Salem, Massachusetts during that year. This image was most likely taken before 1910 but it would not be unusual for a family photography business to have been operating at two or more different cities simultaneously. Perhaps Astoor had decided to move to Massachusetts to manage or work at that location to replace or join another relative already there. What do we know about the subjects of this cabinet card portrait? Not much. We can only surmise by their dress and appearance that they are Aremenian immigrants to the United States shortly after the turn of the century. The woman in the image is wearing traditional clothing including a scarf covering her head and much of her face. This Cabinet Portrait is an image of two Armenian women photographed in Georgia in 1910. Writing on the reverse of the card indicates that the women are named Mara and Jenia.